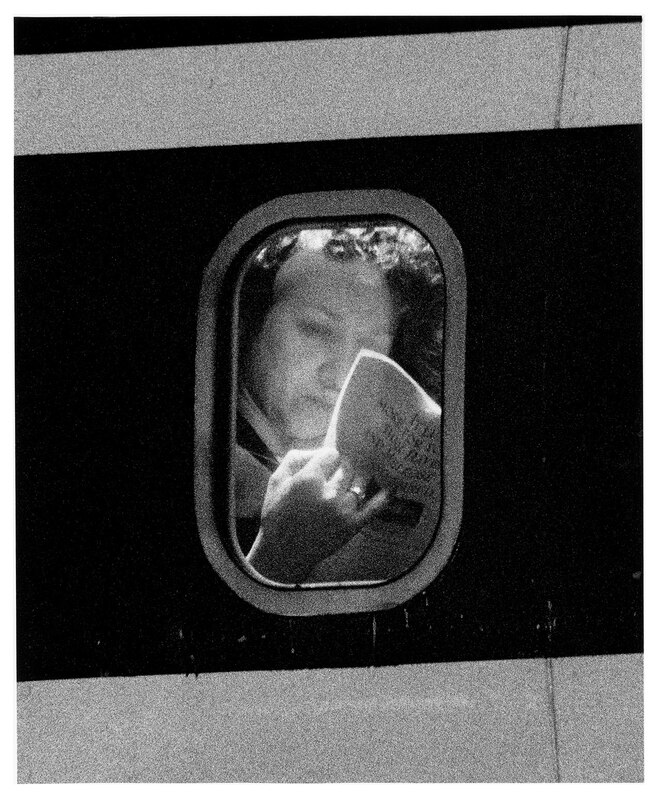 John Schabel’s Passengers, photographs from the tarmac of various airports were striking and mysterious when made and first celebrated as part of the 1997 Whitney Biennial. Viewed now they resonate in ways the image maker could not have fully anticipated twenty years later, post 9/11. Seeing subjects in public, who might imagine that space to be private, are intimate, the simple act of looking fueling this body of works’ singular strangeness. A kind of nostalgia for a vantage point, alters the experience of how we see these portraits. We are pleased to show a selection of images published Twin Palms Publishers in 2013. Schabel has agreed to talk about his work in this brief interview. 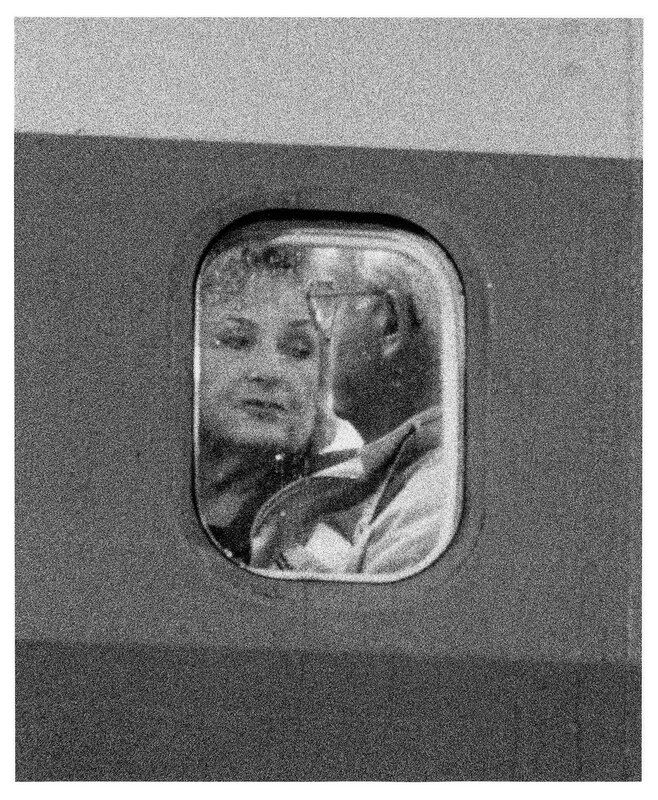 Elaine Sexton: Intimacy and access are two elements that come to mind when looking at these portraits of passengers, each taken from outside an aircraft. What led you to making these pictures? And if you care to share it, how you view them now? John Schabel: I was always fascinated with the state of mind that I get into when flying. The mix of feelings I have looking out the plane window both on the ground and at 30,000 feet. There’s a sense of adventure, a loss of control, a feeling of wonder, escaping the ground, and turning inward. I wanted to make portraits of people in that situation, portraits of a state of mind. There is also part of a childhood memory in them for me. I remember as a child going to our small city airport with my family on rare occasions to see visiting relatives off. The airport had a backyard that you walked through to get to the airplane. There might have been a small lawn but it was mostly concrete. An airline gate was literally a gate in a chain link fence. The passengers walked through it and out onto the tarmac. We stood at the fence and watched our relatives climb a set of rolling stairs, turn and wave to us then enter the plane. They reappeared in one of the windows and waved again. The plane went through its departing ritual, closing doors, disconnecting hoses, starting engines. The noise was deafening and vibrated through our bodies. As the plane turned around to leave, a forceful blast of air from the propellers blew dirt and grit that stung our hands and faces and got in our hair. The plane drove out across the concrete field, turned and charged down the runway. We all continued waving as it rose into the air. We stood and watched until the plane became a speck in the sky and disappeared. Things were on a smaller scale then but I always remembered that point of view, the view from the outside. Although these photographs would be more difficult to do today, I see them more or less the same now as when I made them. They are portraits of people with unknown destinations, sealed in airliners, traveling around the earth. John Schabel was born in Great Falls, Montana in 1957. He lives and works in New York City. He attended Middlebury College, Middlebury, VT and School of Visual Arts, New York, NY. His work was included in the Whitney Museum of American Art 1997 Biennial, New York, NY and the International Center of Photography 2003 Triennial, New York, NY. Public collections that include his work are the Metropolitan Museum of Art, New York, NY, The Whitney Museum of American Art, New York, NY, The Walker Art Center, Minneapolis, MN, The Dallas Museum of Art, Dallas, TX, and The Harvard Art Museums/Fogg Museum, Cambridge, MA. A book of his work titled Passengers was published in 2013 by Twin Palms Publishers.